happy birthday! 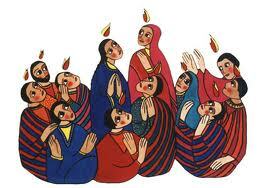 today is the Solemnity of Pentecost, the Church's birthday, and ours! party hard. pray harder. Come Holy Spirit! indeed, i just can't get enough! today, we continue to be open to the promptings, stirrings of the Holy Spirit in our lives, hearts, faithful to our mission: proclamation of God in our Lord Jesus Christ. we do this, as St. Francis says, "always, using words when necessary". sometimes we have difficulty with this, as Billy Joel reminds us. but we continue to struggle with the bad, in order to do the good. last week, celebrating World Communications Day, we know that the Good News must be spread using new technologies as well. there is an old saying by Karl Barth on preaching, theology, evangelization, life, that i love, summarized as: one should always have the Bible in one hand, the newspaper in the other, (and blogs in the other). hmm, ... wait a second, we only have two hands! yes, and? but you mentioned three? let's not worry about details today! the point being is that though Christians have their heads in the clouds, we walk with are feet on the ground, in reality. and i add the bit about blogs, because many of us get our news from these primary sources. for example, a sign of the Holy Spirit is that more and more people are speaking in the language that people today will understand - à la Internet, social media, etc. i love it, and i'm trying to get my A's and B's strait too. Fr. Denis is following this journey too, good times. then, i hear last week, that another brother priest of mine - abbé Julien - is deciding to quit the whole blogging thing. is it one or the other? this makes me think of last week's World Communications Day message on word + silence. not either or, but both, and! regarding Fr. Denis and abbé Julien, i will say what one of my ol' theology professors used to say: "he is right, but you are not wrong". what?! indeed, Come Holy Spirit, help me understand. the stirrings, promptings, are helping Fr. Denis find his voice online (and now twitter too), and i do indeed enjoy his writing, thoughts, ideas, etc. on the other hand, abbé Julien is not wrong to stop concentrating on his blog. his ministry is asking something else of him at the moment. therefore, both are right, eh? the Good News is not meant to be proclaimed only through social media at the expense of the pulpit! the Word continues to be about relationships, community, and we can never neglect the personal relationships! there is always a personal aspect to preaching the Gospel, there has to be! we can blog, play, chat online, but something will be missing if that's it. happy birthday! party hard, pray harder. peace.